The Age restriction is 18 years! Campers must be min. 18 years old by the time of camping. The stay permitted by a “Mutti note” or by supervision of other adults is unfortunately not possible. A private tent must be brought to the camping side. Lockers are available on site! The car can be oarked at the campsite in the short-term parking zone for max. 30 minutes for a deposit of 50, – €. This will be returned. 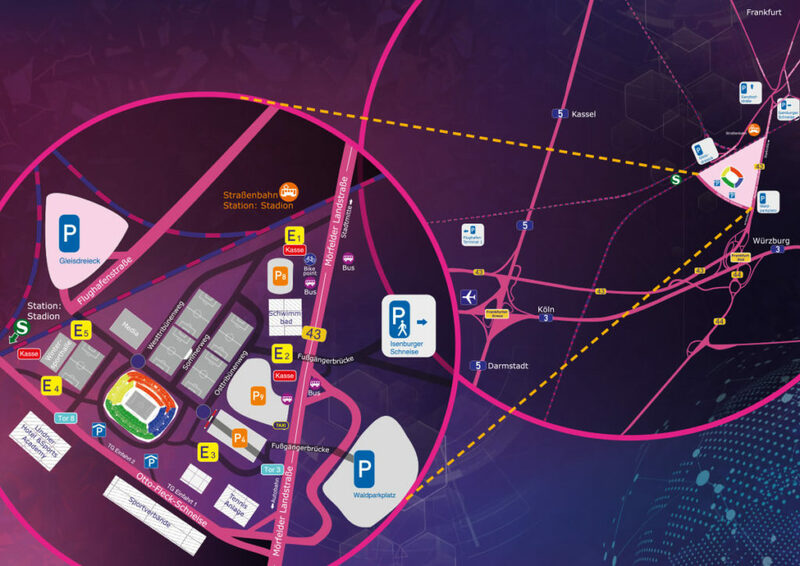 You can find the map of the Commerzbank-Arena here! You can find more information about camping in our FAQs! I have an additional question regarding camping which wasn’t answered here. If you have any other unanswered questions, you’ll find further explanations here. Camping and the access to the Deluxe Camping is only possible with a combined ticket for the BigCityBeats WORLD CLUB DOME 2018. The Deluxe Camping Ticket is only valid in combination with a 3-day ticket (no matter which category). Each person needs their own camping ticket. Without a ticket, no entrance can be obtained. Visitors must be at least 18 years old at the time of camping. The stay of minors accompanied by older people is unfortunately not possible. The arrival is possible from Thursday, 31.05.18, 12:00 o’clock . The clearing of the Camping Area must follow until Monday, June 4th, 12:00 clock. Please note that only in these times an arrival and the appropriate allocation of space can take place. Please note that vehicles are not allowed on the campsite. To make it easy for you to arrive, there is a temporary parking space next to the Deluxe Camping for unloading. Please note that due to the very limited parking spaces, we have to charge a deposit of 50, – EUR per vehicle, which you will get after leaving the car park within 30 minutes at the exit. Vehicles parked in the loading area for more than 45 minutes will be towed for a fee. A parking lot for the entire festival time can be found near the two Areas. More information here. A garbage deposit of 5.00 EUR per person will be charged. You will get this back if you are leaving the camping site clean and with the delivery of the garbage bag. The deposit can be returned on Sundays between 10:00 and 22:00 or on Mondays between 8:00 and 12:00. The terms and conditions of the organizer are accepted when entering the grounds. Tents and tent material, small pavilions (max. 3x3m), tent accessories like camping chairs, disposable barbecues, gas cookers with gas cartridges (up to 450g), beverage kegs (up to 5 liters), beverage cans, plastic bottles and tetrapaks are allowed. Not permitted are home furnishings such as sofas, armchairs, building materials, bulky waste, power generators or aggregates, external car batteries, large music systems, dry ice, liquid grill lighters, refrigerators, laser pointers and megaphones. Disproportionate structures such as party tents are also not permitted. All escape routes are always to be kept free !!! Animals may not be taken. This is primarily to protect the animals – please understand that! Drinks in glass bottles and glass containers are strictly prohibited due to the risk of injury. Please bring your drinks in Tetrapaks, PET, cans, barrels (up to 5 liters). At the access controls, your luggage is searched for glass bottles and prohibited items. Open fire is strictly prohibited on the campsite !!! Exceptions are the grills. For the camping grill small (disposable) gas cartridges up to 450g are allowed. However, we reserve the right to revoke this permission if we find abuse of the cartridges and thus a threat to the life of others. If you want to camp together on the Deluxe Camping site, you must also travel together and set up the tents together. Please understand that Security is not responsible for bringing friendly groups together in the campground. There are generally no vehicles and therefore no caravans or motorhomes allowed.